Mark elected to enter the MLB amateur draft after his junior year and signed with the Atlanta Braves. He spent four and a half years playing in the Braves organization and made it to AAA, but injuries hampered his career. Highly regarded in the Braves organization, Mortimer was selected to join the Atlanta Braves coaching staff at the major league level as the bullpen catcher for the 2002 and 2003 seasons. There he worked with Leo Mazzone and a superstar pitching staff that included Hall of Famers Greg Maddox, Tom Glavine, and John Smoltz. He also threw batting practice daily and worked with hitters such as future Hall of Famer Chipper Jones. 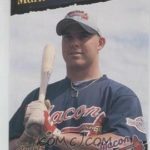 After his stint as a bullpen catcher, Mark founded the BigStix Baseball organization in 2006 with his long-time friend Jack Stewart. He also became the hitting and catching coach at powerhouse Parkview High School for four years, winning two State championships and one National championship. After coaching at Parkview, Mark opted to return to school and finish his degree in criminal justice at Georgia Gwinnett College. While working on his degree, he was a volunteer assistant coach at the first year NAIA school in 2013. After graduation, Mark was hired as an Assistant Coach and Recruiting Coordinator at Division II Augusta University. He worked with hitters and catchers before being named pitching coach halfway through the 2015 season. Mark is now back to working full-time with Elite Sports Complex. He is one of the top hitting and catching instructors in the Southeast, and once again concentrating on building his BigStix Baseball program that has seen numerous players sign college scholarships and professional contracts. He also attends yearly mission trips to Nicaragua, where he mentors adults and children about the game of baseball. He resides in McDonough, Georgia with his wife of 16 years, Christy, and son, Logan.